Seasonally spiced & lightly sweetened vegan chocolate chip pumpkin cookies. Soft, chewy, and ready in 30 minutes or less to satisfy any fall craving! These cookies took a few batches to get right, but it was a worthwhile (and delicious) process in the end. Originally I planned to make this recipe with oats because I just really love oatmeal cookies, but in the end I decided to do without. Though oats are considered safe for some Coeliac’s, there are still quite a few people who have reactive issues even when they use certified gluten free oats. At any rate, the texture of this oat free version was immeasurably better in comparison. When I say these cookies melt-in-your-mouth I’m not exaggerating. In addition to being gluten free, these are also egg free. Since pumpkin puree adds so much moisture to baked goods, I decided to ditch the eggs altogether so that this didn’t end up tasting too cake-y. The pumpkin puree replaces the eggs in these, like how banana can sometimes replace eggs in vegan baking. Because they don’t have that extra binder you need to let these cool before handling too much, but once they set they hold up perfectly. Personally I think they taste better on the second day anyways once the flavors have all melded together. Speaking of flavor, I also used coconut sugar in place a white/brown sugar which adds a slight caramel flavor to these cookies. What’s more fall like than pumpkin, caramel, and baked goods? I understand that coconut sugar isn’t necessarily the easiest ingredient to source though, so if you’d like you can swap the coconut sugar and use 1/4 cup white sugar + 1/4 cup brown sugar, or just go all out 1/2 cup brown sugar. If you use white sugar your cookies will have a slightly more crunchy texture. So here you go – another chocolate chip cookie recipe to add to the collection. 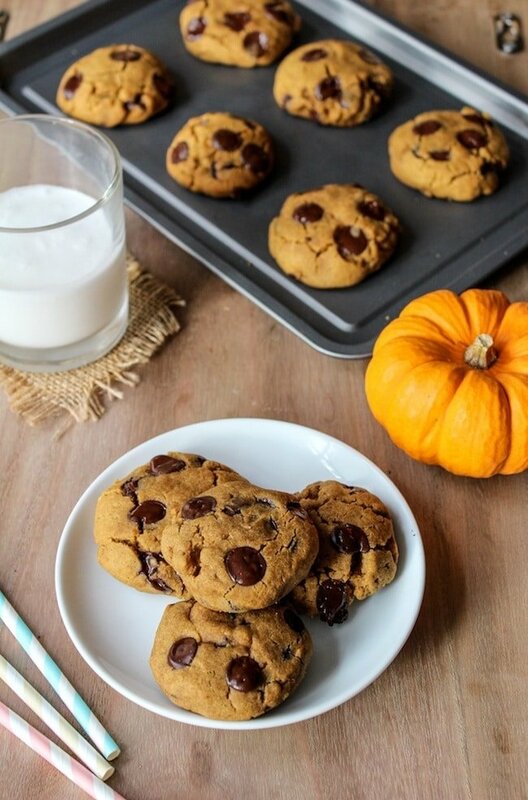 Don’t forget to #asaucykitchen on instagram if you try these vegan chocolate chip pumpkin cookies! I’d love to see what you make with it! You can also post your pictures to my facebook page! 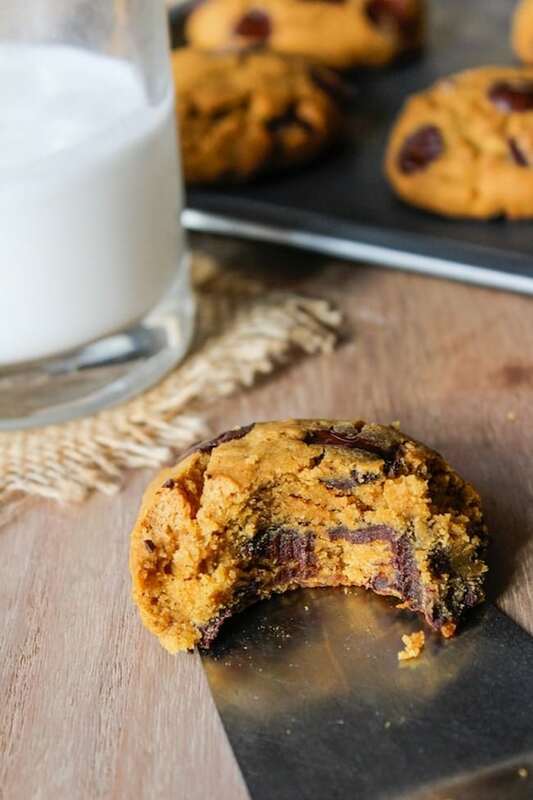 Melt-in-your-mouth, vegan chocolate chip pumpkin cookies. Soft, chewy, and ready in 30 minutes or less to satisfy any fall craving. Heat your oven to 350°F/180°C. Line or lightly grease a large cookie sheet. Set aside. In a large sized bowl mix together your coconut oil, coconut sugar, vanilla extract, and pumpkin puree until smooth. Set aside while you mix your flour. In another bowl whisk together your flour, salt, baking soda, baking powder, cinnamon, and nutmeg. Add the flour mixture to your wet ingredients a little bit at a time until everything is combine. Fold in your chocolate chips. If your dough looks and feels a little oily at this stage then cover and refrigerate for at least 10 minutes. Roll out the dough into little balls about the size of a tablespoon and place on your baking sheet. They won't spread out too much while baking so flatten them a bit after placing them down. Bake for 8-10 minutes. Let the cookies sit on the baking tray for about 5 minutes before transferring them to a cooling rack. Since there is no egg in this recipe it needs to cool down a bit to set. If it’s a regular gluten based flour then you don’t need the xantham – that’s just there to help with the binding that you get normally from gluten. Hope you like them! Awesome thank you! Should i use the same measurements for the GF flour if I’m using all purpose flour? Hi! 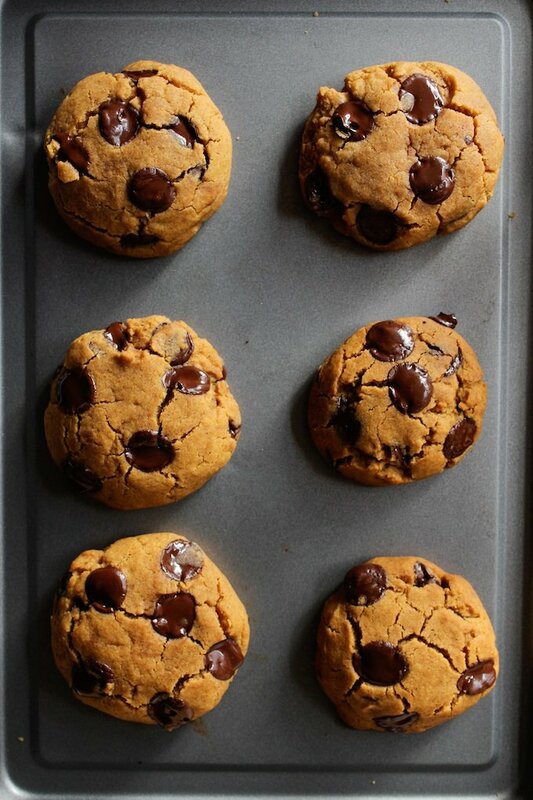 These cookies looked amazing so I thought I would give them a try….quick question: I melted the coconut oil then put it on my scale to make sure it measured to the correct amount. Did the same with the rest of the ingredients and my dough was super oily. Should I have weighed the oil first in it’s solid form then melted it down and added the rest of the ingredients? Hi Kim! Did the cookies come out oily after you baked them or was it just the dough, prebaked? If you’re using a scale to measure the oil then you should end up with the same amount whether it’s in a solid or liquid state. Coconut oil can make cookie dough feel a bit too oily sometimes but that usually goes away after cooking or after refrigerating the dough for a little bit (about 30 minutes). My “dough” came out course and crumbly. I followed the recipe but used 1 cup cassava flour and 1/2 cup tigernut flour. In place of the gluten free flour blend. They are both supposed to be able to substitute 1:1 with regular flour. Do you know what may have gone wrong? Hi Stacey! I haven’t been able to try tigernut flour myself, but I have played around with cassava flour and in my experience it’s kind of a hit or miss as to how well it can be substituted for other flours. Sometimes it worked out and sometimes it was a big flop. There’s always a risk when substituting flours for recipes that weren’t tried and tested with those flours. Different flours have different amounts of protein and fibre, they have different textures and often weight different amounts. For example: 1 cup of rice flour weighs about 160grams and 1 cup of cassava weighs around 120grams. All of these differences in flours make it really difficult to make big substitutes without noticing. That is very helpful Sarah. Thank you so much! Hi Sarah, I made these today and mine came out a little mealy. When preparing the batter I did notice it got very thick and dense and thought that adding more coconut oil may help but I didn’t have any left unfortunately. Any thoughts? Hey Melissa! When you say that they came out mealy do you mean the cookies or the dough? Sometimes when working with coconut oil the dough can look like it’s sandy and dry, but when you actually roll the dough together it’s totally fine. I wouldn’t recommend adding more coconut oil that what’s listed in the recipe – cookies tend to spread a lot more with coconut oil & too much would end in a flat mess. I hope that makes sense but feel free to get back to me if that didn’t actually help at all! That’s a great tip about the coconut oil. It was the cookies that were a bit mealy. I had a feeling something was off because towards the end of adding the flour the dough became very, very thick and a little hard to work with. Maybe I used a little too much flour. I also noticed that the coconut oil didn’t really get emulsified with the rest of the ingredients when mixing so maybe that contributed to it. I really like the flavor though and definitely plan to try out the recipe again. Thanks Sarah! This vegan chocolate cookies are looking amazing, I will definitely try this recipe. Thank you for sharing this delight with us. Wow!! We absolutely looooovee these cookies! I have made them twice, the first time with whole wheat flour and the cinnamon and nutmeg called for. I thought they were tasty but a little overpowering. The second time I made them I used 1 cup white flour and a half cup of sorghum flour. I also used one and a half teaspoons of pumpkin pie spice instead of solely nutmeg and cinnamon. These little changes REALLLLY knocked these cookies out of the park! Being the only vegan at my workplace it was exciting to have everyone tell me how wonderful they were and see their shock when I told them they were vegan. I give the recipe here four stars, but The second batch I made with small changes were perfectly spiced and moist and deserves 5!! I definitely have a new favorite cookie!!!! I love it when you’re able to make something gluten free and/or vegan and people don’t know without you telling them – definitely feels like an accomplishment 🙂 Also really glad that you enjoyed these! I’ll try it out with pumpkin spice next time I make these – can never go wrong when pumpkin spice is involved! Thanks for sharing! What brand of gluten free flour do you use with this recipe? I want to make sure to buy one that I know works well with the recipe! Hi Virginia! I typically use dove’s farm plain white flour blend or my own flour blend that I share here: http://www.asaucykitchen.com/homemade-gluten-free-flour-blend/ . The dove’s farm brand is one that I buy at Sainsbury’s and I think it’s only sold in the UK. That being said, this recipe has been really popular this season – I’ve tagged loads of times on instagram with people sharing what they made and I doubt most people made it with either of those gf flour blends so I’m sure most blends would work. Ok great! Thank you so much! I can’t wait to make them! Hi Sarah! I just wanted to let you know that I made these with all Einkorn flour (low gluten, ancient grain) for the flour, no xanthum gum, and refined coconut oil for neutral flavor. They turned out absolutely GREAT and were a huge hit with my friends. Thank you so much for this awesome recipe!! Thanks for coming back to share your adaptations! I’m so glad you guys liked them! Literally the best cookie recipe ever!! I have made this weekly since discovering it on Pinterest last fall. Can easily be made fructose free and will melt in your mouth! Could I use almond meal or almond flour? Not sure if it has xantham, probably not. Does flax meal then work instead as I don’t have xantham either. Thanks! Hi Shery! I’ve never tried this particular recipe with almond meal/flour so I couldn’t really say how it would perform. Sorry! Do you have to defrost the dough before baking or can the dough go right from the freezer to the oven? You can bake directly from frozen – just add another 2-3 minutes onto the baking time and you should be good to go! Hi, just curious if I could substitute butter for coconut oil? I need them to be egg-free but not necessarily vegan and I don’t seem to have any coconut oil on hsnd. That’s totally fine! Hope you like them! j’aimerai avoir une précision sur la farine ? tout usage ou sans gluten pourriez-vous me répondre merci. Hi Ava! I’ve made this recipe with gluten free all purpose four (a blend of gluten free flours). I’ve adapted this recipe from Sally’s Baking Addiction and she uses regular all purpose (with gluten) so you can use that if you like. I hope that helps! Hi! great recipe. i was wondering if i could substitute the flour for chickpea flour? Hi Natalie! I’m afraid I haven’t tried it with chickpea flour so I can’t say for sure, but I came across this thread talking about using it in cookie recipes that might help answer your question. It sounds like the people who have tried it have had success, it might just change the taste a bit http://cooking.stackexchange.com/questions/33041/what-side-effects-should-i-expect-by-replacing-cake-flour-with-chickpea-flour-in Now I really want to try baking more with chickpea flour myself! I made these yesterday and added Quivk oats, I didn’t have xanthum but used ground flax instead. they turned out sooo moist and yummy! Thanks Beth! So glad you liked them 🙂 And thanks for sharing the changes you made! I am very interested in the quantity of quick oats you added, would you be able to advise? I was thinking to leave the chocolate chips out and add the oats. I can’t wait to try these! They sound delicious! I don’t have xanthan gum. Is there a substitute? Thanks! Hi Laura! If you have any psyllium husk on hand you can sub that one for one with the xanthan, but I realize psyllium is an even more obscure ingredient than xanthan so there’s a good chance you won’t have that. You can make this without the xanthan – it just might be a little bit more crumbly than normal. Hope you like them! A lot of gluten free all purpose flour mixes contain xantham gum already!! If it does then you already have it!! I’m just wondering if I could substitute vegan butter for the coconut oil in the same quantity? Thanks! Hi Andrea – that’s totally fine! Hope you like them! My GF flour does not have xantham gum in it. Should it be added and if so how much? Hi Sarah – these are gorgeous pumpkin cookies. ‘Tis the season!!!! Hi Leah, sorry about the instructions – some of my posts have been messed up recently because of an update I made on my site. I thought I fixed all the posts, but I guess I forgot this one. The post should be fixed now with all the right info (btw it’s 1/2 cup sugar). Thanks for letting me know! Apologies on the last comment, was in a hurry and just wanted to read the recipe and not the entire post. Needless to say I FOUND the sugar amounts….ha, embarrassing. Am I the only crazy one here? The instructions say to add the Coconut Sugar but the amount is listed no where…… ?? Am I missing something??? How much sugar do we add??? Hey Nikkie! I’m so sorry about that! I updated the plug in use to format my recipes yesterday and it messed up some of my recipes that included links to amazon. It’s taken out some of the amounts/ingredients. I thought I fixed them all this morning but I guess I forgot this post. Sorry about the confusion! Thank you for pointing it out to me so I could fix it! Do you happen to have the nutrition info for these? Really just wondering how many calories in one :). They look amazing! Hi Jennier! I just ran the ingredients through a nutrition generator and it’s telling me there are 200 calories in 1 cookie (assuming you end up with 12 cookies total). Hope that helps! Hi Sarah! I made your pumpkin cookies and they turned out tasting delist but so dry that they crumbled-even before I baked them ? Please tell me what I did wrong. Sorry they turned out so crumbly for you! The crumbliness before they even bake makes me think they might have been a bit too dry. How did you measure out the flour? Flour is one of those things that can be tricky to get right if you use measuring cups because depending on how you do it you can get too little or too much flour. Another thing it could be is the coconut oil. If it’s not mixed in all the way it could leave dry pockets of dough making it too crumbly. Try melting the coconut oil if you make these again. I did say to use softened coconut oil originally, but I think melted coconut oil might be more reliable. Have you watched the video I included in the post? If you haven’t it might help to watch it through to see if there is anything I did differently while making these. I hope this helps, but let me know if you have anymore questions! I used gluten free all purpose flour. So we can use whole wheat flour and if so should it be the same amount? It’s been a long time since I’ve baked with whole wheat flour, so Im not sure. From my understanding, when using whole wheat in place of all purpose it’s best to only substitute half the amount of AP flour with whole wheat. Otherwise it starts to change the texture and taste too much. Hope that helps! Hi Joan! I haven’t yet tried this using grain free flours (though now that you mention it I’ll think I’ll start working on a recipe for it). That being said, I can’t say for sure how it would come out. If I were to try it out I would probably try using 2 cups almond flour with 1/4 cup tapioca flour in it’s place. I’ve also seen this paleo flour blend from A Calculated Whisk that could be a good option to use a replacement http://acalculatedwhisk.com/paleo-321-flour-blend-gluten-free/ Hope that helps! Just made these…sooo delicious!! Thanks for a great recipe! Where should I store these? I know they probably won’t last more than a few days, but best on the counter in a container or in the fridge? These cookies are really mouth-watering!! Chocolate & pumpkin? Oh my, these sound dreamy! They look gorgeous and so delicious! Love that they are Paleo too! Thanks, Neli! They aren’t technically paleo because I used GF all purpose flour which has rice flour in it, but they are free of refined sugar and they are vegan/low fodmap. 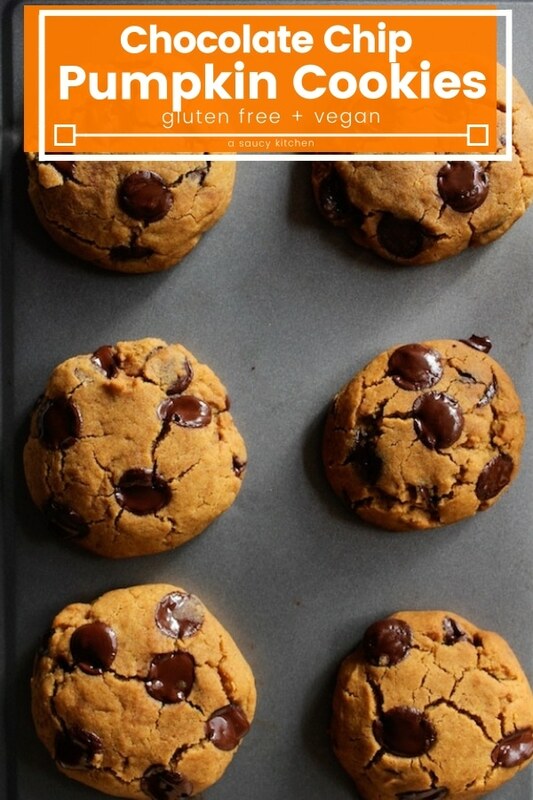 I love pumpkin chocolate chip anything, and these cookies look so good. I love the melty chocolate! Just wanted to let you know that I’m featuring the on Savoring Saturdays this weekend. Thank you for linking up! Thanks so much for sharing these with us at Savoring Saturdays, Sarah! I’m going to feature them at this weekend’s party – hope to see you there! My husband loves pumpkin and chocolate- he would LOVE me to make these, especially since they are way healthier than so many recipes that I have found! I’ve just recently turned my own husband into a pumpkin lover with all the pumpkin baked goods 🙂 Thanks, Barrie! I find vegan baking to be quite challenging sometimes because I can’t get the texture right. I have yet to master the chia egg…I’ve got the pumpkin puree to thank for the texture in this! Let me know how it works out for you if you try them! These cookies are so soft and moist looking…I so want one of these ever since seeing the photo on facebook this morning 🙂 Super yum!! This looks really good and so timely with the pumpkin season, tell me, did you use a store brought gluten free flour blend did you create your own? Hi Charlene! Thank you 🙂 I actually just used a generic store brand for these. Now that you mention it, I’m going to start working on my own blended version for the future, so thanks for the idea! Loving the sound of these cookies. Your photos are gorgeous in this post and yes isn’t it interesting to look at your own older photos and see how you’ve improved? When I look back at my oldest blog photos I do not even know what I was thinking – I mean some of the photos are just so so bad! Amazing how you can turn things around though : ) Pinning! I know a lot of people like to update and delete old posts, and I’m not above doing that, but at the same time I like being able to look back and see what a difference a bit of practice makes….and then get really embarrassed because they’re so bad! Anyways, thank you so much! Your photos are already great, and the cookie looks so inviting!